Retaining its First livery and fleet number 34110, it departed Great Yeldham this morning destined for its new Rotherham home for further restoration. On arrival, I was encouraged to see more workers than last time awaiting for the arrival of their transport. 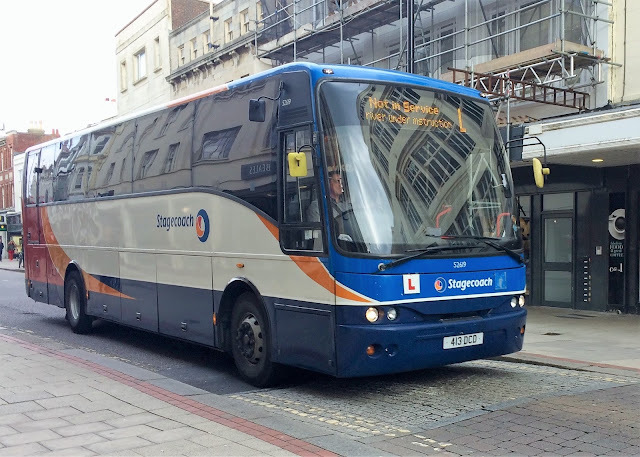 I was quite surprised that only Plaxton Paragon bodied Volvo B12M 20501 (AO02RBY) arrived which was clearly too small to take all the passengers! 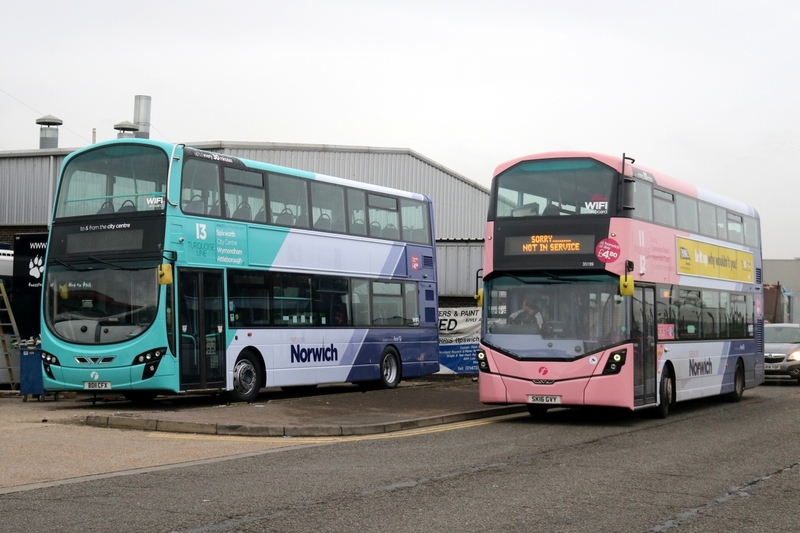 Thursday took me to Norwich to catch up on the latest arrivals and repaints around the local operators. 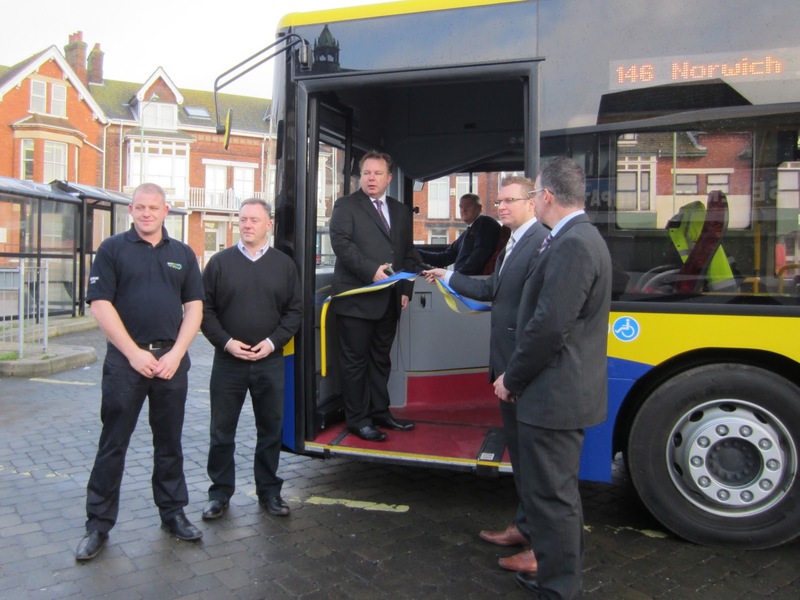 First sighting was a new arrival for Sanders working the X11 Express service. 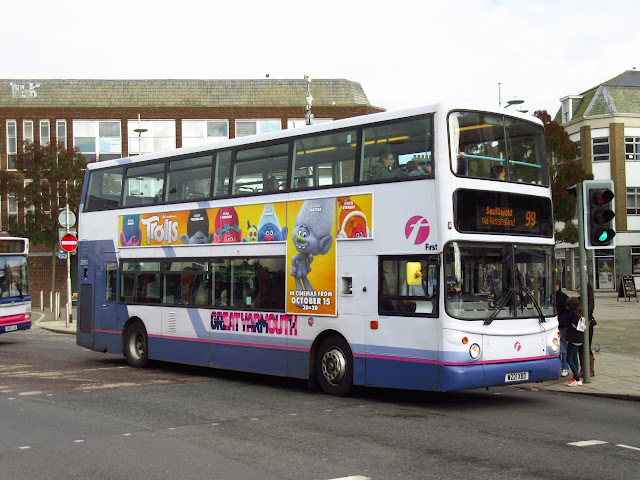 DK09DZH is a Volvo B7RLE and has been aquired along with sister DK09DZD from GHA Coaches. 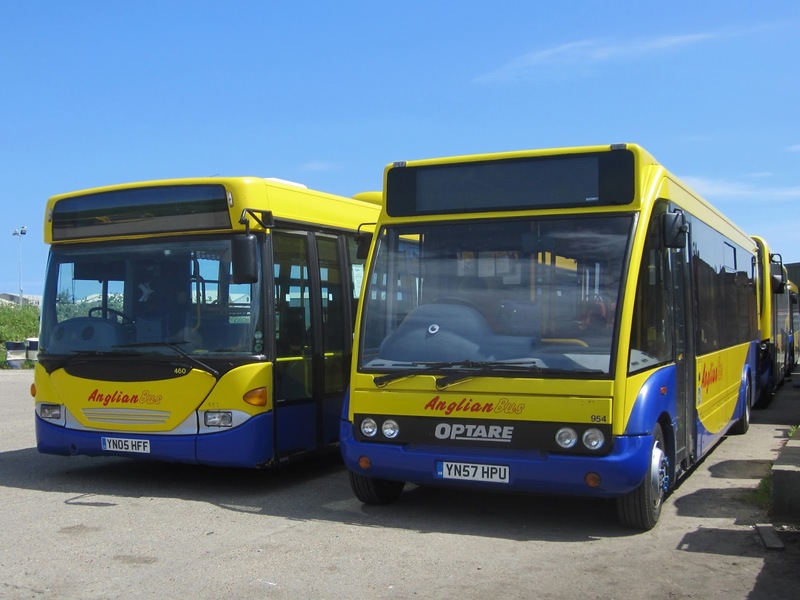 Three Coaches have also recently been purchased, DA04GHA, FN09AMX & FN09APY. 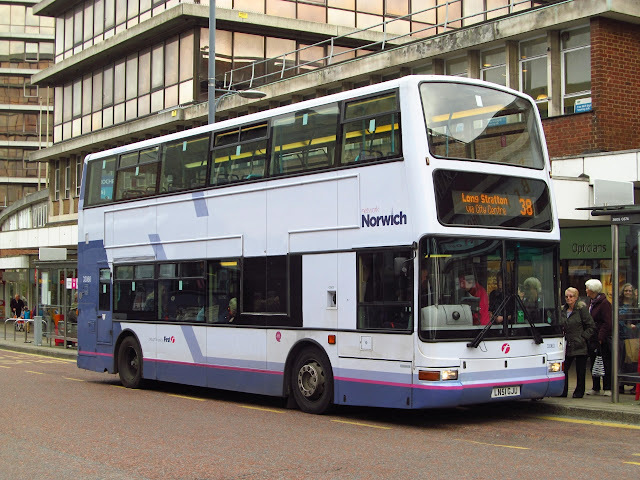 First are beginning to apply new Network Norwich branding to the fleet and a few were noted out and about on my wanderings. 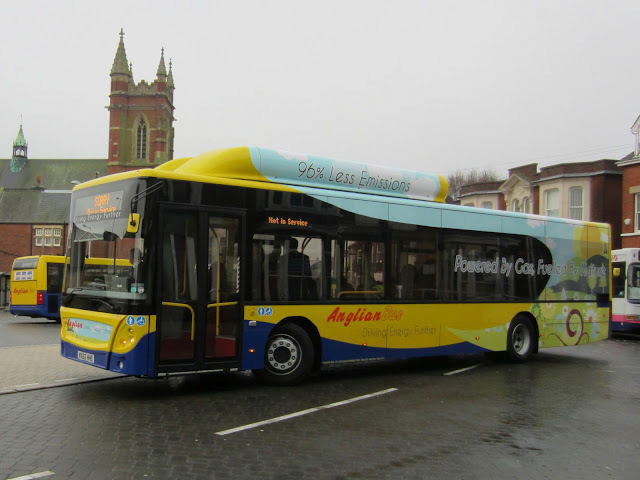 Trident 33060 LN51GJU in St. Stephens showing off its new branding, it carries a much larger version above the entrance door also. 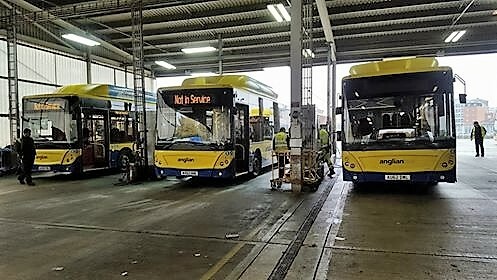 Two Geminis are gaining a new Turquiose livery for service 13, 36173 BD11CFX is the first to return to service in its new look, 36171 is away being painted at the moment. 36194-36197 have all entered service this past week with 36193 heading to Simon Morris in Ipswich for repaint into Red Line livery, this will see the withdrawl of Tridents from the route also. 33057/33058 among the first to be stood down, its believed these will transfer elsewhere within Firstgroup. 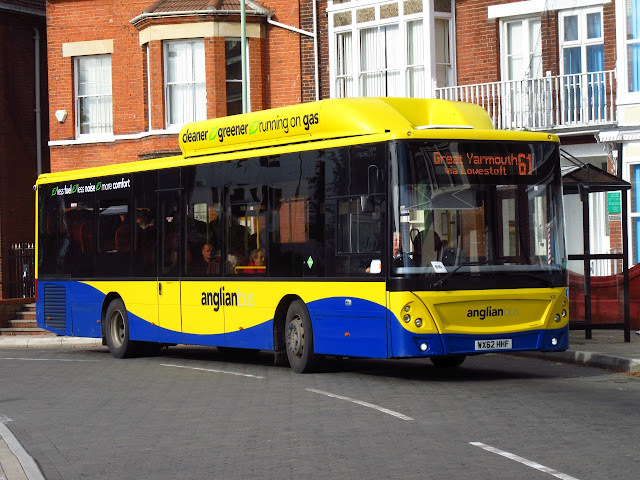 A short outing to Gorleston High Street this afternoon where I observed BorderBus' recently acquired Alexander Dennis Enviro200 on the 580 to Beccles and Bungay. 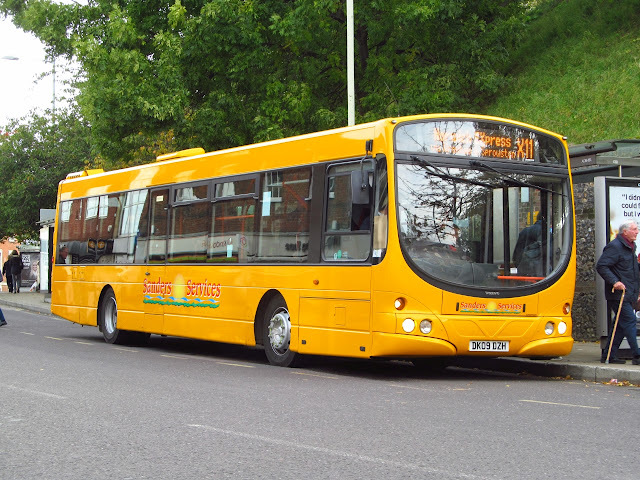 I made my way back through Shrublands Estate and was surprised to see a southbound First service to the James Paget Hospital using the southern part of Almond Road heading east! The only reason I could suggest that happening was that Forsythia Road was temporarily blocked; as the northbound service successfully negotiated its normal route only minutes later. The main news of the weekend was the departure of Anglian's gas buses to the south west of England but I was unable to be there to witness the event as I was in the Midlands visiting the outlaws! Their departure means the resurrection of Scanias OmniLinks 450/1/4/5 (YN07LFU/EZB, YT11LVF and AN61LAN). 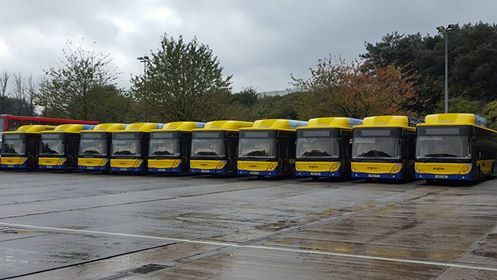 Five OmniCity buses also rejoin the active fleet, namely 458-62 YN05HFH/J/F/G and YN03WRJ. Former Brighton Trident 712 (T812RFG) also returns to service. This means the active fleet has now dropped to 28! 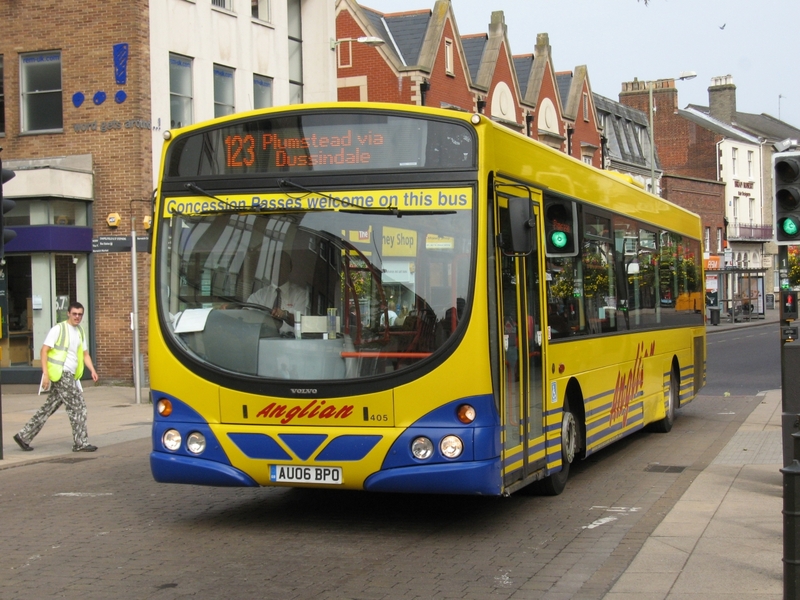 A trip over to Lowestoft this morning enabled me to grab a few shots whilst wandering around catching the latest Pokemon with my son Finlay, luckily all sightings corresponded to a Bus being nearby also! 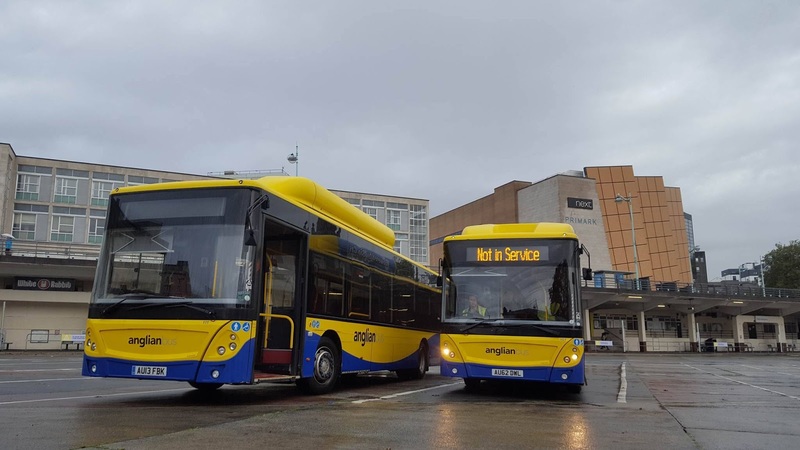 It was of course the last day of operations for Anglian's fleet of MAN Ecocity Gas Buses before they head off to their new home at Plymouth, i caught WX62HHF waiting its next run through to Yarmouth at the Bus Station. Yarmouth based Volvo B7TL 32061 W221XBD was also spotted in use at Lowestoft today working the 99 to Southwold, seen above passing the Railway Station. "Ivana" waiting to deliver its fuel load. 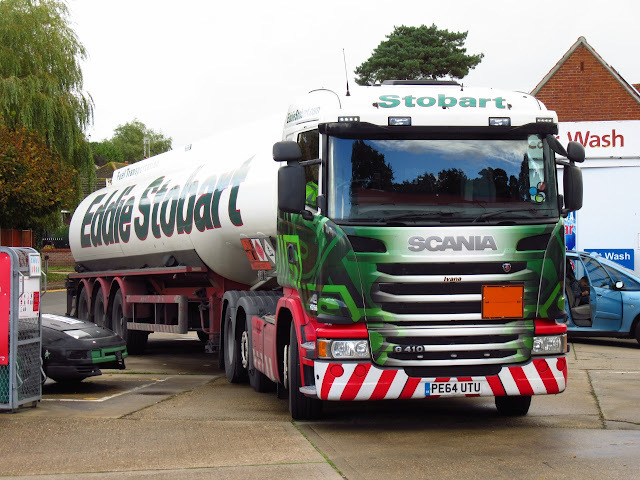 Final spot of the day was not Bus related but a very rare sight indeed for me in my home village of Ormesby St Margaret, seen delivering to the village Petrol station was Eddie Stobart Tanker PE64UTU "Ivana". We all know the popularity of this well known haulage company and it was certainly a surprise to see it this morning. 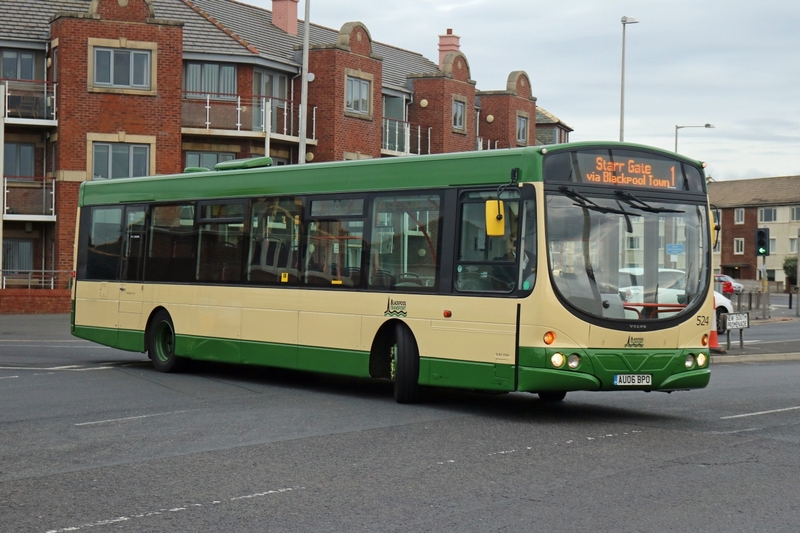 A Former Anglianbus Volvo B7RLE has been treated to a makeover by its current owners Blackpool Transport. AU06BPO was new to Anglian in 2006 before being sold and passing to the North West company in 2010 along with others from the same batch. 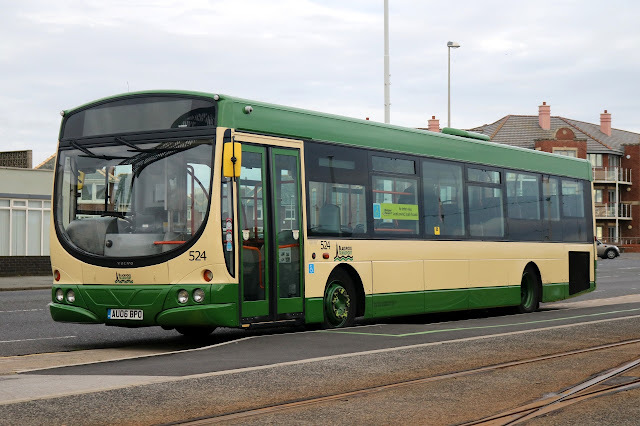 It has been repainted into the old traditional Green and Cream livery of Blackpool Transport and was revealed at a recent event in Blackpool and ran alongside many of the preserved vehicles that operated for the company. Now 524 with Blackpool, pictured alongside the Tram lines. Many Thanks go to David Warren for use of his excellent photgraphs. 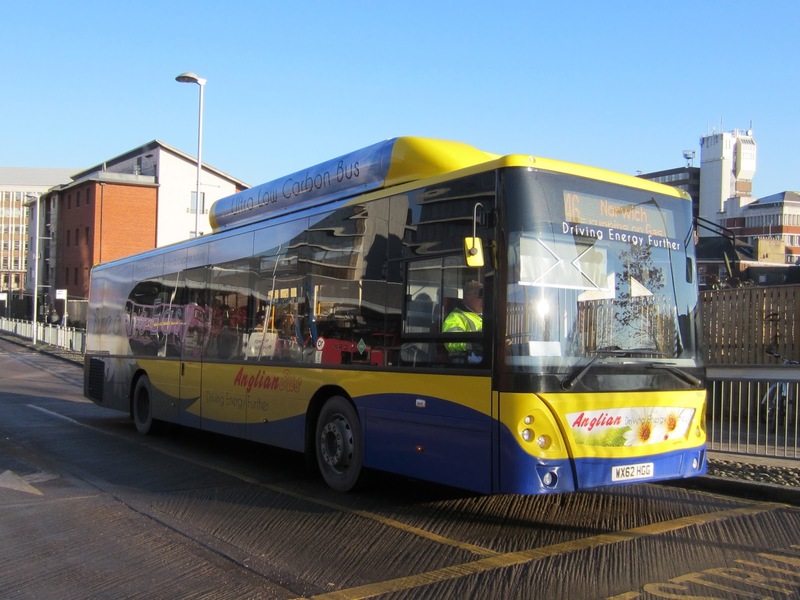 The first in the fleet 100 WX62HHP at Market Gates in January 2014 - a favourite of blogger SteveW! The latest repaint for the Norwich Network to be completed in Gemini 37173 BD11CFX, it has gained the Turquoise line colours for service 13 which runs from the city to Spixworth, Attleborough and Wymondham. 36173 pictured outside Simon Morris in Ipswich. 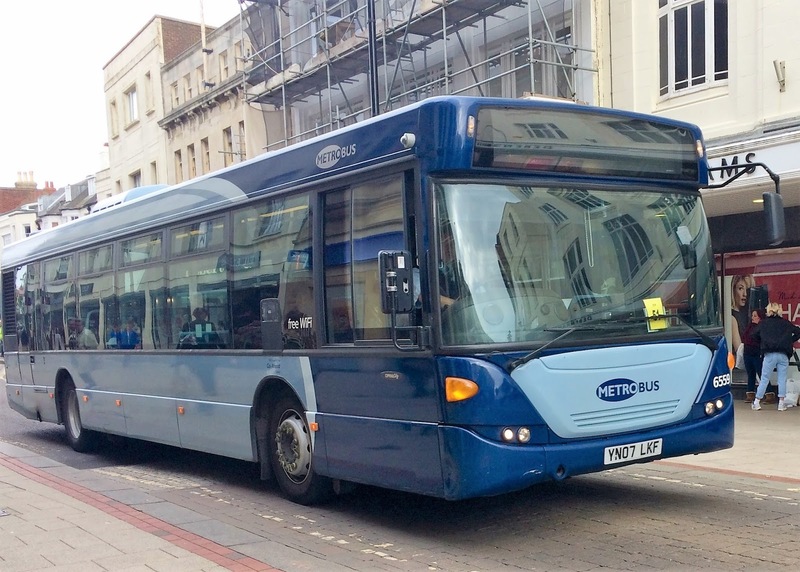 It left Ipswich early this morning and was quickly reported on social media back in Norwich around lunchtime. Another visitor to Simon Morris was Streetdeck 35199 SK16GVY which had some bodywork whilst there. 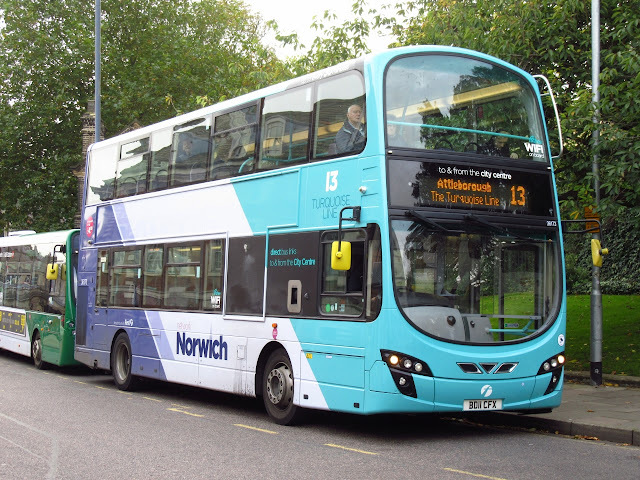 36171 BD11CFU has now gone to Ipswich also to gain the new Turquoise livery. Pastel shades in Ipswich this morning! 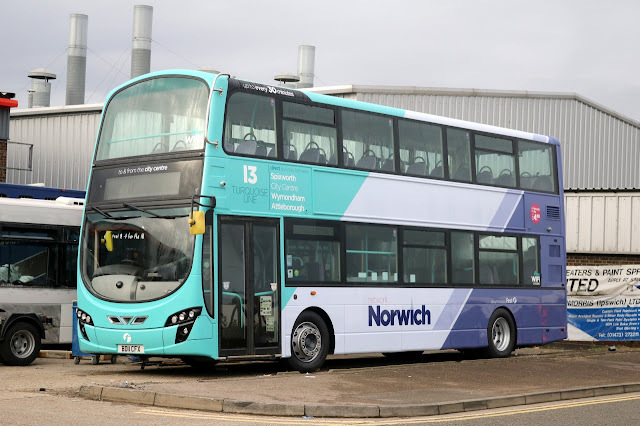 Another vehicle currently at Simon Morris for repaint is Volvo B7L 66333 MV02VBY which has been repanelled and is awaiting is turn to be outshopped in the latest livery. 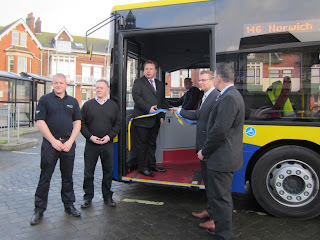 Many Thanks to David Warren for the excellent photographs. Firstly apologies for the dearth of posts on the blog lately - due to a lack of activity on my part plus not much happening locally at the moment! Following its availability being advertised on the Preserved Owners Facebook Group, a preservationist from Yorkshire has come forward to purchase 34110 for further restoration. 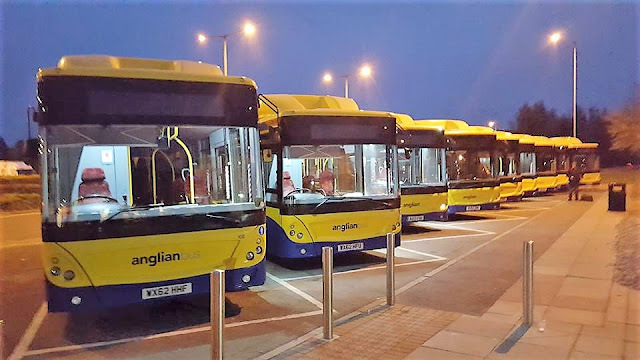 Whilst the new owner wishes to remain anonymous for the time being, Colin assures me that he is very genuine person with a proven track record. 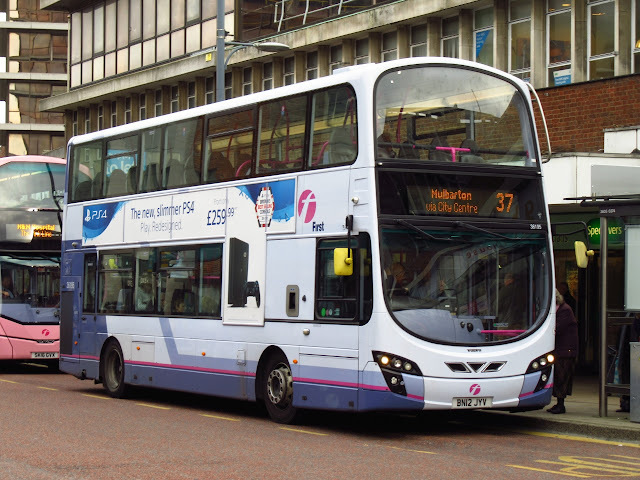 This morning I have received some surprising news from Colin Thorne concerning the former First Eastern Counties Olympian 34110 (W437CWX) in that he has decided to withdraw from the project. 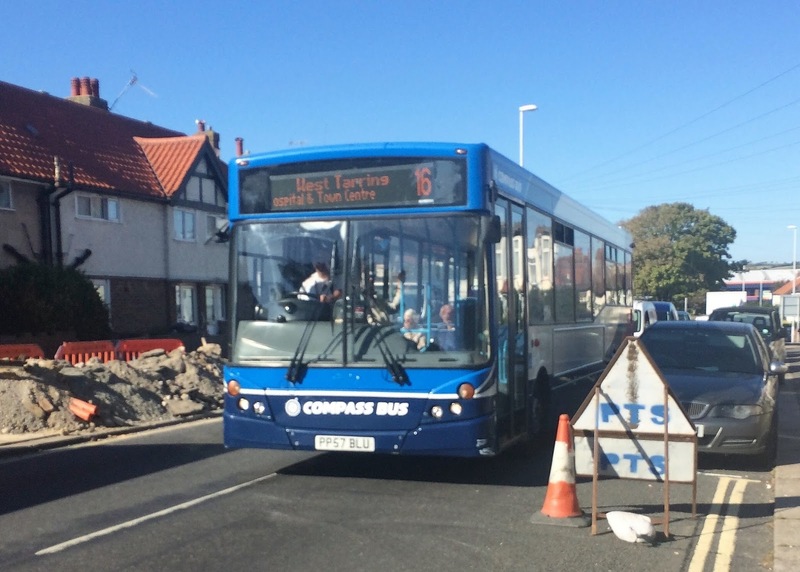 Colin's financial circumstances have changed during the past year and as things currently stand he is unable to make any serious progress with it. His abandoning of the project has been due to lack of finances and engineers prioritising other work. It is also forcing one of his other vehicles off the road as he has had to use the legal tyres off another. This means he has to keep a perfectly usable vehicle off the road for 34110 which is nowhere near roadworthy and won't be for sometime yet. He considers that realistically 34110 does need a massive amount of work with the corrosion bad enough to justify scrapping. As mentioned on the blog previously, there's holes in the chassis over the rear axle which weren't seen until the wheels were removed. That's without a lot of mechanical work required too including brakes and airbags He says if it wasn't for it being the last UK Olympian he would simply walk away and scrap it!